Geneva is a hub of NGOs and the United Nations, but it's just as interesting for travellers as it is for diplomats. Set in the far southwester corner of Switzerland, Geneva is within easy distance of the Alps. The city itself offers a range of unique attractions, from the lake that feeds the Rhine River to the Jet d'Eau, the world's tallest water fountain. Geneva is Switzerland's second-largest city in terms of population, after Zürich. Jet d'Eau - Jet d'Eau is an impressive water fountain pumping water 140 metres high. It's a free attraction that is open from 10:00am to 11:00pm every day, year-round. It is also one of the city's most photographed sights. The spectacular plume was once an occasional pressure release for hydro-power generation on the Rhône River, but people liked it so much that in 1891 the city created a permanent pumped fountain. It's beautifully lit at night. Best viewed from a distance — the surrounding half kilometer is soaked with water. However, the more adventurous might want to try the pathway leading right up to the Jet d'eau -- prepare to get enjoyably wet! Old Town (Vieille Ville) - Aside of the cathedral the Old town in general is worth walking around in for a hour or two. Among the highlights are the city hall with the cannons in the little square opposite to it, Rousseau's birth house and various antique shops with all sorts of interesting stuff in the windows. A word of warning to people with physical disabilities: the Old Town, is situated on a hill with quite steep streets leading up to it. Fete de Geneve - The festival 'Fete de Geneve' takes place along the lake in August every year with musics, bands, processions and fireworks etc. It is a week long festival which is attended by people from all over the world. It is difficult to find a place in hotel during this week. Geneva has warm summers and moderately cold winters. Temperatures from June to September are between 21 and 25 °C, winters from December to March are above zero during the day, around -3 °C at night. 36 °C and -18 °C are the absolute high and low. Precipitation is quite evenly distributed throughout the year though summers are somewhat wetter with sometimes heavy showers and thunderstorms. Winters have some snowfall. Geneva International Airport (GVA) is the main gateway. Dozens of airlines serve cities in Europe and further away. Lowcost airline Easyjet has many flights to/from Ajaccio, Alicante, Amsterdam, Asturias, Barcelona, Bastia, Belfast, Berlin, Birmingham, Bordeaux, Bournemouth, Bristol, Brussels, Budapest, Cagliari, Copenhagen, Dubrovnik, East Midlands, Edinburgh, Glasgow, Ibiza, Las Palmas de Gran Canaria, Lisbon, Liverpool, London, Madrid, Málaga, Manchester, Marrakech, Nantes, Naples, Newcastle, Nice, Olbia, Palma de Mallorca, Paris, Porto, Rome, Sharm el Sheikh, Split, Stockholm and Toulouse. Some of them are seasonal only. Many other airlines mainly serve European destinations (as far away as Moscow and Reykjavik. Cities further away include Montreal, Toronto, Algiers, Mauritius, New York, Tel Aviv, Cairo, Kuwait, Tehran, Beirut, Amman, Riyadh, several places in Tunisia and Morocco, and Tashkent. Note: Before passing through customs, a machine dispenses free 80-minute tickets for Transports Publics Genevois, which are valid for both the city buses and trains to Geneva. Rail: There is a railway station with trains to Geneva-Cornavin station, and other cities in Switzerland. Check the Swiss Federal Railways website. There are also direct trains to Paris, Marseille and Montepellier]] with the SNCF network of France. Bus: There are local buses that stop at the airport. There are also buses to and from Annecy, France, and also seasonal buses to ski resorts like Chamonix in France and ski resorts in Switzerland. Car: taxis are available but expensive and not worth the money. Rental car facilities are available as well. Swiss Federal Railways serves Geneva's main railway station (simply called Genève, but traditionally also called Gare de Genève-Cornavin, or simply Cornavin) with direct trains to and from Neuchâtel, Biel/Bienne, Luzern, Winterthur, St. Gallen every hour, and Berne and Zürich every half-hour. Regional trains heading to Nyon, Morges and many other villages along the northern shore of Lake Geneva, and inter-regional trains heading to Lausanne leave every 15 minutes, and further to Vevey, Montreux, Martigny, Sion, and further to the back of the mountainous Valais in Visp and Brig at least every half-hour. Normally they depart from Genève-Aéroport. The Gare des Eaux-Vives is another public transport station and it is situated on the southeastern side of the lake on the other side of the river Rhône. It has French bus services with the SNCF to and from Evian, Chamonix and Annecy. It's being renovated, since a new rail line has been built to link Cornavin to this train station. International trains leaving from Genève include the French (SNCF) and Swiss National Railways (SBB CFF FFS) coorporating high-speed TGV-Lyria service. There is a direct service from Geneva to Paris (570km) with a journey time of three hours seven times per day, as well as a direct service to Lyon (2h), Avignon (3h), Marseille (3.5h) and Nice (6.5h). There is a direct connection between Milan and Geneva, traversing the Alps through the Simplon massif four times a day. Once a day this EuroCity (EC) service directly connects Geneva with Venice via Milan. The motorway network brings you right into Geneva, only 40km from Annecy and 80km from Chamonix with customs at Bardonnex - Saint-Julien. You need the compulsory motorway sticker (single annual Fr. 40 fee) to come through this customs office. Purchase of the motorway tax sticker (aka Vignette) at one of the customs is obligatory in order to drive on Swiss motorways. Geneva is served by a number of regular international bus routes (Bus station: tel. +41 22 732-0230). Additionally, the (Geneva Public Transport) provide regular services from the neighbouring French towns of Saint-Julien, Archamps, Thoiry, Ferney-Voltaire, Moillesulaz (tel. +41 22 308-3434). Compagnie Générale de Navigation sur le lac Léman (CGN) has boats to for example Lausanne and Montreux. All boats arrive at the Paquis port after docking briefly at Parc des Eaux Vives and the Jardin Anglais. Private boat tours and transfers from Geneva to any port on the lake by Léman Transfers. Groups of up to six passengers can be privately chauffeured around the lake. If you want to explore the mountainous countryside or go skiing in one of the ski resorts in the Alps, getting a car is a better option. Numerous local and international car rental service providers operate from the airport. They provide customized traveling services to the needs of tourists visiting GenevaThe city centre of Geneva is famously congested and as such driving into the city is not a good idea. Transports Publics Genevois provides transport by bus, tram and trolleybus. There are also connections by boat on the lake. Check the schedules to see what the options are. Tickets cost Fr. 2 for a short hop (three stops or less, or a one-way crossing of the lake). Fr. 3 for one hour with unlimited changes on tram, bus, boat, and rail within greater Geneva, Fr. 8 for a day pass valid 09:00-23:59, and Fr. 10 for an extended day pass valid from the time it is purchased until 05:00 the next morning. Holders of the SBB Demi-Tarif/Halbtax card get 20-30% off these prices. If you're staying for more than a few days, consider buying a week ticket for Fr. 38. It's sold at official TPG offices, located at Cornavin station, Rive roundabout and the suburb of Grand-Lancy (the last one is pretty off the beaten path for most visitors). If you stay in a hotel, hostel, or on a camping site, you will get free public transport. Typically, you will receive a Unireso Geneva Transport Card at check-in. It will be authorised for use for the length of your stay and like a ticket one gets in the airport upon arrival it is valid for Geneva and suburbs including the Unireso network. You are supposed to carry your passport or identity card with you at the same time, to ensure validity. The ticket is valid on trains as far as the airport. One pass is valid for a maximum of 15 days, and it is valid also on the day you check out from your place of stay, which is handy if you have a late flight and want do some sightseeing or shopping. Tickets, which cover trams and buses, must be bought from ticket machines (located at every stop) before boarding the transport. Some bus stops do not have a ticket machine, in that case you can indicate to the driver that you need to buy a ticket at the next stop. You can get pretty much everywhere by bus. Some routes are rather confusing, so it's good to get a map of the network which can be picked up at the official ticket vending points, or viewed/printed out from their web page. When you are on the bus, however, bus stops are both announced and visible on a screen (on most buses). Observe that you will need to purchase a separate ticket if you are travelling outside the canton of Geneva - i.e. to or from France or the canton of Vaud. "Ordinary" tickets and day passes are only valid inside Geneva (known as Zone 10). Bus stops in France that are served by the Genevan transport authority do not have ticket vending machines, instead you have to buy the tickets from vending machines on board the bus when traveling from France. Geneva has a network of four tram lines; 12, 14, 15 and 18. Three of them pass through the major transportation hub at the Cornavin train station, and all of them have a station close to Place Bel-Air on the old-town side of the river. If you did not receive a TPG/Unireso card from your hotel, you will need to buy a ticket from one of the ticket machines located at every stop before boarding the transport. Tickets cover both trams and buses. Suburban trains to outskirts run every half hour during the day and every hour after 20:00. The last train to the eastern terminus, (Coppet), leaves at 00:03. Though these "Regios" mostly serve commuters, at least two of their station stops, Versoix and Coppet, have several good restaurants and historic main streets. There is also another suburban rail line: the RER Genève, which goes from Cornavin to La Plaine, sometimes continuing to France (2 stops from La Plaine). As with buses and trams, tickets must be bought before boarding the train. If you are only travelling with the canton of Geneva, a bus/tram ticket is valid on the train and vice versa; travelling further afield will cost more unless you buy a regional ticket, which also includes parts of Vaud and France. The old-town can be easily visited on foot starting anywhere around the tour boat dock on Lake Geneva, or if you come from the Cornavin station, walk down to the Bel-Air island and continue straight on uphill to the old town. Crossing the bridge (Pont du Mont Blanc), you'll get to the English Garden with the famous flower clock and a sculpted bronze water fountain. Then you can cross the street (Quai de General Guisan) and go up the hill (on Place du Port and Rue de la Fontaine) and up the long stairs passage and end up behind Saint Peter's Cathedral. After visiting the cathedral, which is Geneva's well-known landmark, you can exit the courtyard and be right in front of Geneva City Hall. From there you can easily walk down to the Bastions Park where you can find the famous Reformation Wall memorial. This park is very quiet and romantic, especially at the beginning of the fall season when the leaves start falling. Geneva is fairly walkable but the fact that the name of some streets change frequently as you walk can make navigation difficult. For instance the street from Bel-Air square to Rive roundabout has five different names on a section of less than a kilometre. Geneva is a great town to get around in by bicycle. Except for the old-town, the city is fairly flat, and though there are some streets that are dangerous to ride, there is almost always a safe, fast route to your destination. If you want to know the best routes, you should get a copy of the beautifully designed VELO-LOVE plan de ville, which is available at all bike shops in Geneva, or by writing to: velo@ville-ge.ch or calling +41 22 418-4200. A social organization called Genèveroule lends bicycles free of charge (for four hours and then a fee of Fr. 2 per extra hour), from 30 April through 30 October. A passport or identity card must be shown and a refundable deposit of Fr. 20 is required. Six stations are located along the lake, behind the railway station, in Eaux-Vives (Terrassière) the Plaine de Plainpalais and at Carouge. While this service is quite convenient, be sure to bring ID and contact information, including hotel phone number, to speed up the paperwork. Otherwise, if you're looking for a road bike or a trekking bike, then there is a shop very near the train station called "Bike Switzerland". 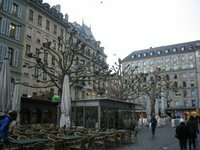 Geneva has a huge number of restaurants for a city its size, and the international community means there's more variety than you'll find in most Swiss cities. On the downside, Geneva is possibly the most expensive city in an expensive country. Additionally, it can be quite difficult to find food on Sunday night, so it might be worth planning ahead or just visiting the more touristy region near the train station. If you have the possibility to cook your own food, self catering is a good idea to save money. If you are staying for a longer period, it's a good idea to make shopping trips to supermarkets in France where many foods cost less than half of what they do in Geneva. Around a dozen of the best bars in town are located around the Plain de Plainpalais, the area southwest of the old town. This shouldn't be surprising since the many buildings of the Université de Genève are ranged around it as well. There are a lot of hotels in Geneva, but very few of them are actually in anything like the budget range. Hundreds, many right around the central Cornavin train station offer a pretty standard rate of Fr. 135 per night for a single. If you arrive late and are willing to spend that it makes sense to look at the automated hotel board in the train station to find the nearest vacancy. It's hardest to find lodging during large international conferences, and trade shows. The latter, of which the prime example is the Salon d'Auto are usually held at Palexpo. It's worthwhile to do a bit of research to see if your arrival is likely to coincide with one of these events. For lower hotel prices, try the outlying French cities of Annemasse or Gaillard which are conveniently accessible via public transit from Gare Cornavin. Four Seasons Hotel des Bergues is a historic hotel on the shores of Lake Geneva. Many foreign professionals working in Geneva are employed by one of the United Nations agencies or international banks. Non-Swiss UN employees get a special visa to live and work in Switzerland, but the jobs can be hard to find unless you are already in Geneva. If you are a EU citizen, you can accept a job offer by any other employer since the bilateral agreements between Switzerland and the EU allow you to work here as anywhere else on the continent - whether you are a blue or white collar worker. Unemployment is on a rather stable level but the uncertainties during the financial crisis led to higher competition for jobs. For temporary or student jobs such as work as an au pair, a housekeeper, or at one of the many bars, you do not necessarily need to be very proficient in French. You ideally should be in town to set this sort of thing up. If you want to do household work, you will probably want to advertise on the bulletin boards which can be found at the entrances of most grocery stores, at the English and American churches, and at the American Women's Club, and join the respective groups online, such as on Facebook. For a bar tending job, talk to the manager (you should know enough French to serve drinks). Switzerland has a high rate of people with their own internet connection and computers, so internet cafes are not as common compared to other countries and compared to the past. But still you will be able to find a computer in the main cities and tourist areas, also at libraries, video rental shops, train stations or tourist information places. Wifi is widely available, though sometimes at a cost. A growing number of hotels, restaurants, coffee bars and fastfood joints now offer free wifi. Switzerland's country code is 41 and the emergency phone numbers are 117 (police), 118 (fire department) and 144 (emergency rescue service/ambulance). Swiss phone numbers consist of the area code and a local phone number. The area code has three digits and starts with a zero, such as 022 for Geneva. The local phone number has usually 7 digits, but there are numbers with only 5 or 6 digits. If you stay for some time, it may be advisable to buy a pre-paid cell phone card that you can use in any phone that supports the GSM standard on the 900/1800 MHz bands - they usually cost around 10-40 CHF and are obtainable in the shops of the mobile service providers Swisscom, Orange or Sunrise in most cities. Mobile network coverage is close to 100% by area, even in the mountainous, non-populated areas. There are also a lot of cheap prepaid cards for local calls from other providers. The prepaid cards of the big supermarket chains Migros and Coop for example cost around 20 CHF and include already 15 CHF airtime. The cheapest prepaid card for calls within Switzerland is Aldi Mobile. The cheapest prepaid card for international communication is Yallo. The prepaid cards can be bought online (30 CHF with 30 CHF airtime inclusive), in most post offices (29 CHF with 20 CHF airtime inclusive) or Sunrise shops (20 CHF with 20 CHF airtime inclusive). Swiss Post is the national postal service of Switzerland and has fast and reliable services. For more information about prices to send postcards, letters and parcels, both domestically as well as internationally, they have a very useful Price Calculator. Domestically, there is priority mail (arriving the following day) and economy mail which takes 2-3 days to be send within Switzerland. Stamps can be bought at the post offices or from shops and kiosks that also sell postcards. In general, post offices are open from 8:00am to noon and 2:00pm to 5:00 or 6:00pm, with a lunchbreak in between. Opening times on Saturdays are usually only during mornings. Larger cities and central post offices might keep longer hours and skp the lunchbreak. If you want to send packages internationally, you might also consider international courier companies like TNT, DHL or UPS. We have a comprehensive list of accommodation in Geneva searchable right here on Travellerspoint. You can use our map to quickly compare budget, mid-range or top of the range accommodation in Geneva and areas nearby. This is version 25. Last edited at 7:48 on Aug 16, 17 by Utrecht. 109 articles link to this page.